Ah, the internet - your source of misinformation. How does 37% accuracy sound to you? I imagine it sounds pretty awful. However, if you are using a wine app to research wines, that could be exactly what you're getting. Recently, one such app was brought to our attention here at Miller Wine Works and the results were disturbing. Of the 100 different wines this app had posted for Miller Wine Works, 63 never existed, 26 were no longer available, 11 needed corrections to their entry, 3 were completely unlisted, 1 linked to a wine by a completely different winemaker, and one was listed as being made the year Gary Miller turned 3 years old. We immediately reached out to the app developers for help to get these entries corrected. However, their tech support told us they rely entirely on user submitted data and refused to correct the entries. This is one of the most popular wine apps on the market with over 19 million users worldwide. Those are 19 million wine enthusiasts being misinformed on our wine selection and we could do nothing within the app to prevent such egregious errors. Except warn you. Buying wines in a tasting room is not always an option for our customers. In this case, a wine app seems the best way to access wines from out of your area. However, we recommend being diligent in your research. Read below for some fun facts about Miller Wine Works that will help you verify that the wines on your apps are indeed our wines. 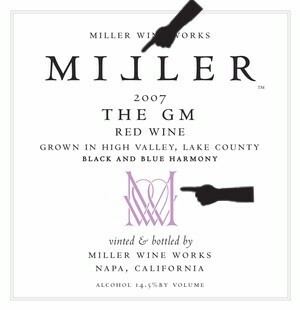 Our labels have always carried two unique characteristics, the "Backward L" in Miller and the Miller Wine Works logo. Our Wines are available for purchase at our Miller Wine Works website, with the exception of our Napa region Library Wines which are only available to purchase through our shop or through Gary Miller directly. Any questions can be answered by emailing Gary Miller. Above pictured is a label from our Napa bottling of our 2007 The GM (one of the wines that has recently been featured as a futures offer as it has been reworked using Sierra Foothill fruits for a whole new take on an old favorite). Notice the distinctive "Backward L" in the large Miller, the logo of intertwined MWW, the distinctive font and graphic layout? Only wine labels with these features are Miller Wines. If an app claims a wine is ours that doesn't have this layout, it is an erroneous entry. Other erroneous entries would be wines with a vintage older than 2000 or in a region other than Napa (and Napa adjacent), Amador County, or El Dorado County. In happier news, it isn't too late to get tickets to Feast at the Foundry! A fantastically fun evening of wine, dinner and dancing under the stars! Not only will it be fun, it will also go toward an amazing cause. Knight's Foundry is America's LAST water-powered foundry and machine-shop. This site is a National Mechanical Engineering Landmark but is listed as one of America's most endangered historic places. Without the help of the community, this site could be lost forever. The easiest (and most fun) way you can contribute to the preservation of this historical treasure is to purchase tickets to the Feast at the Foundry and join Miller Wine Works and the rest of Wine on 49 for an unforgettable night. Can't wait to see you all there!